men’s and women’s swim teams rebounded with routs over Howard University. It was a great day in the pool for the Drexel University men’s and women’s swimming teams when they faced off Jan. 19 against the Howard University Bison in Washington, D.C. With the men’s team coming off a home loss to the University of Delaware and the women fresh off home losses to Delaware and Northeastern University, both teams were eager and prepared to get back in the water. The Dragons noticeably outmatched the Bison, dominating nearly every event in the meet en route to blowout victories for both the men and women by scores of 156-39 and 128-62, respectively. Head swimming coach Shawn Markey was thrilled with his team’s performance. An impressive 13 different Drexel swimmers finished first at least once throughout the day, as the Dragons won 20 of the 22 total events. On the men’s side, senior David Boodey, freshman Matthew Klotz, freshman Joel Berryman, sophomore Mike Krohn, freshman Kyle Lukens and sophomore Chad Schmidt notched first-place finishes, with both Krohn and Lukens placing first twice. Krohn and sophomore Andrew Reimon took the top two places in the 400-yard individual medley, touching the wall in 4:20.32 and 4:22.52, respectively. The Dragons swept the top three spots in the 100-yard butterfly , with Lukens leading the way in 50.74 seconds. It was more of the same in the 100-yard backstroke, with Lukens heading a Drexel sweep in 53.42. He was followed by sophomore John Quagliariello in 54.47 and senior Dan Zalkind in 55.43. Schmidt won the 100-yard breaststroke in 59.15, a race in which Drexel swimmers took the top four places. 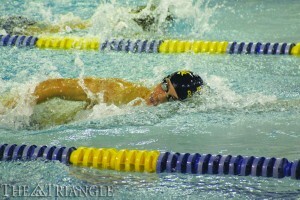 The Drexel men also swam to easy victories in the 200-yard medley and freestyle relays. The women’s races featured victories by freshman Tina DeRusso, sophomore Brianna Bentz, sophomore Katie Duggan, senior Lauren Faykes, sophomore Jessica Gidzinski, sophomore Gizem Yali and freshman Tori Graf. Faykes and Bentz each recorded two top-place finishes on the day. DeRusso cruised to a win in the 1,000-yard freestyle in 11:09.12, which was over 16 seconds ahead of her opponent in second place. Bentz won the 200-yard freestyle by over 5 seconds in 1:59.51 and the 100-yard butterfly in 59.38. Yali took first for the Dragons with a time of 59.36 in the 100-yard backstroke. The most impressive performance of the day came from Faykes. The standout senior posted yet another stellar performance in the 400 yard IM when she swam away from the field and placed first with a time of 4:31.49. The time earned Faykes yet another place in the Drexel record books, as it was nearly a second ahead of Heather Parry’s record of 4:32.45 set in 1990. Despite the difficulty of breaking such a long-standing record, Markey was not surprised that Faykes was able to accomplish such a task. Further adding to the excitement of a very successful meet was the fact that the win was the first of the 2012-13 season for the women’s team. Despite an 0-8 record entering the meet in the nation’s capital, the ladies were able to remain confident and put forth multiple strong performances. After the meet, Markey talked about how it felt to finally get into the win column. Next up for the Dragons is a Feb. 2 meeting with the Lehigh University Mountain Hawks in Bethlehem, Pa. Lehigh’s men’s and women’s teams are 3-2 and 1-3 on the season, respectively. With a full two weeks between competitions, the Dragons will return to the Drexel Pool for what Markey said will be “one of the hardest weeks of the season. We are looking to peak training this week and then work on the finer points throughout the following week with starts and turns.” The final dual meet of the season is expected to be a close one and will likely supply some excitement as the regular season begins to wind down.